KOHH’s verse is only available on the physical version of Blonde. 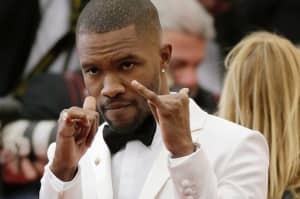 Yesterday, Frank Ocean broke the internet when he announced pop-up locations for his Boys Don't Cry zine and dropped his third studio album, Blond. Inside the mags, fans found a physical CD of the album, spelled Blonde with an 'e.' Upon further investigation, it appeared that the CD version had a different tracklisting from the online version. Along with the zine, Frank Ocean provided a long list of contributors including Beyoncé and Kendrick Lamar. The list also had some lesser known names like KOHH and Loota, who are Japanese rappers associated with Korean rap phenom, Keith Ape. While KOHH is not featured on the online version of Blond, KOHH's verse is prominent in the extended cut of "Nikes," which is only available in the CD magazine version. Frank wasn't kidding around when he said he got two versions. KOHH enters the extended cut of "Nikes" at the 4:53 mark and raps in Japanese for the last minute of Ocean's single. Read on to learn more about the unexpected Frank Ocean collaborator. After being raised by his grandmother and drug-addict mother in the projects of North Tokyo, KOHH started rapping when he was 18 years old. In a recent interview with Ebro Darden on Beats 1, KOHH cites Japanese rap group King Giddra as an early influence and Kanye West as his favorite American rapper. However, KOHH's often menacing, sometimes inflammatory rapping style bears more similarities with Kanye's protege Travis Scott and Atlanta rapper OG Maco. After releasing multiple mixtapes and albums for about 3 years, KOHH caught the world's attention with his verse on Keith Ape's 2015 viral hit, "It G Ma." The Western world was fascinated with its first glimpse of the growing rap scene in Korea and Japan, and "It G Ma" eventually scored an American remix featuring A$AP Ferg, Father, Waka Flocka, and Dumbfoundead. Ever since, KOHH has been gaining more notoriety. In October 2015, his third studio album DIRT was met with acclaim, and his music videos have racked up millions of views. In November of the same year, he premiered a World Star Hip Hop exclusive music video for single, "Glowing Up." In December, KOHH and OG Maco featured on the same song, "Buchiagari," produced by DJ RYOW. Apart from doing music, KOHH is also a runway model. (Update 8/23/2016 10:25 a.m.): In an email to the FADER, a representative for KOHH explained that Frank Ocean asked for KOHH specifically to come to the studio he was working in. The name of the studio or the city could not be disclosed. When asked for a statement from KOHH, his rep responded, "Sorry... KOHH doesn't like to talk about himself by himself." KOHH's fourth studio album DIRT II is out now. Watch the video for its first single, "Dirt Boys II," featuring Dutch Montana and Loota below.